They say a picture paints a thousand words. This may sound as too cliche, but nevertheless, it is still true. A photograph speaks for itself and words that are too little will fail to justify it. That is how powerful the medium is and it is up to you to use it to your advantage. This is why you cannot immediately call someone a photographer just because he has a camera. If you are in the small business, needing to promote something or a brand, it can get a little complicated. But if it is just for the outdoors on warm summer days when the occasion calls for the skills of a professional photographer, then you might as well make it worth your while and worth your hard-earned money. Taking pictures is not as easy as it looks like on a mobile phone. It takes art, the right skills, and mastery to perfect it. Even then, it can still go wrong, depending on who looks at it. With nature and with the outdoors, your opportunities are quite endless. But lack of light also makes for limitations you cannot control. However, with the right people working with the right tools, state of the art photography as it has become an art in its own right, will be more than possible to achieve. And as the years have passed by, photography became broader. Enthusiasts became bolder, experimenting with their skills and creativity in taking pictures. You may also see photography quotation formats. The wonders of nature, especially with the sunlight in the open air and people taking a dip or a stroll, will be more than enough for any concept. Places like the beach have the ability to provide camera owners with natural lighting. And a reflector used by a skilled photographer will be able to work with what light he has and use it to his advantage. You may also see quotation sample templates. There’s also the idea of photographs being taken in places where you would require no blocking rays. Sunsets and sunrises are in itself already majestic. There are golden hours of the day where people can look their best no matter the angle. That is how nature works for you and a professional should never miss that part. 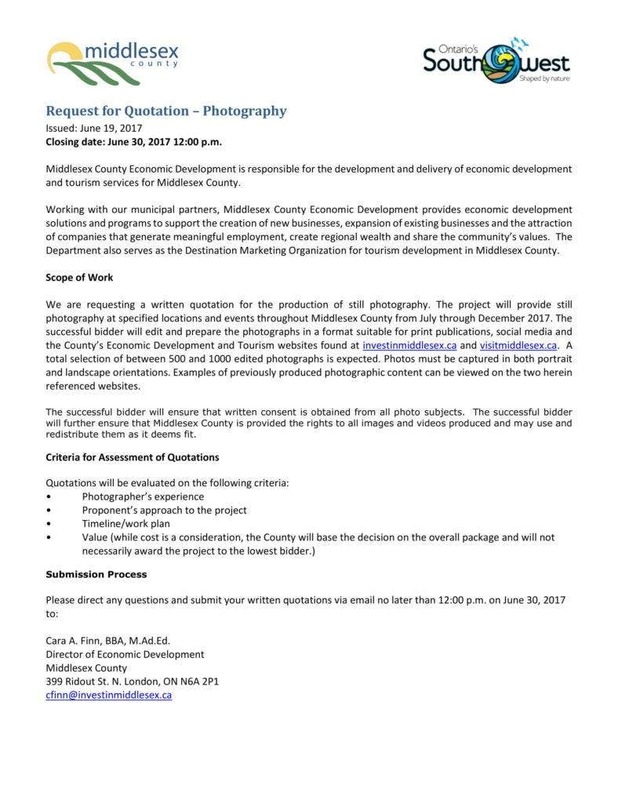 This is what you have to look for when you decide to hire and submit quotes for photographer services bids opened in your area. 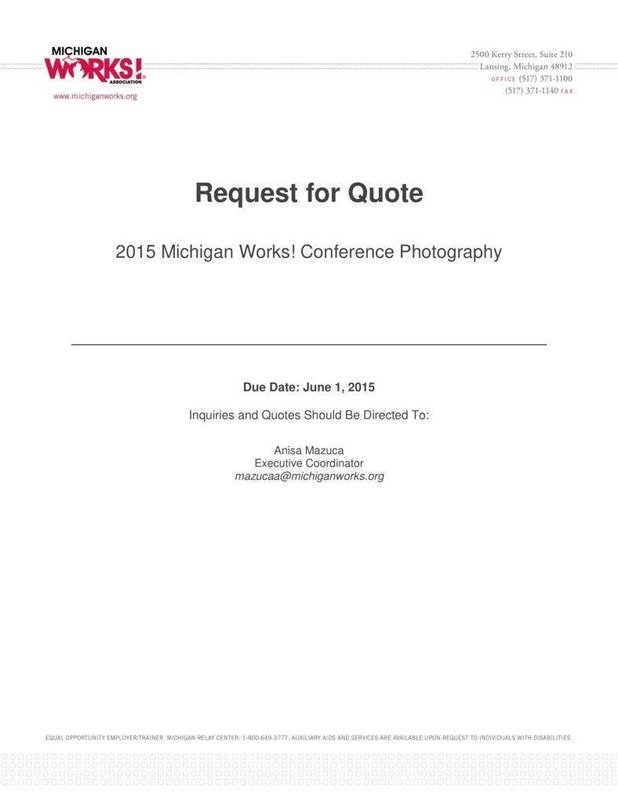 You may also see photography quotation template formats. A professional needs to do more than just work the camera and call the snapshot art. He has to understand techniques and be able to work with it, especially outdoors where timing is everything for the light to work in your favor. You may also see sample quotation templates. Then again, it also presents some challenges that only a professional have the patience and talent to overcome. If you are there for an important event, it is better to hire someone who can do the job right. Trusting yourself with it may be too risky if you want to finish on time. Or you may need to come up with results that are good enough for the eyes of your family who takes reunion and weddings seriously, or for your boss who does not take anything less than perfect for the photo side of marketing. Look for someone who knows the importance of timing. Better yet, research about this first so that you will have better chances at scoring only the experts to work with you on a project. You may also see quotation formats. 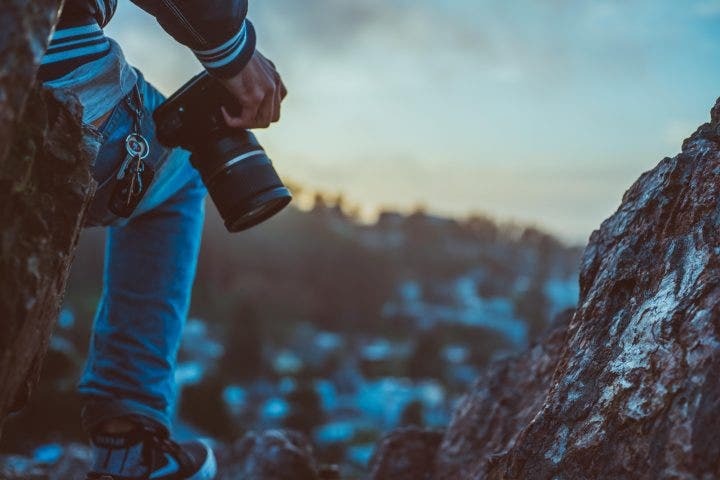 If you are not too familiar with hiring freelance photographers or those who work for agencies, check with the locals and the neighbors about their go-to photographer. It is better if you come up with a shortlist so you can narrow your choices later on. There are those who pose as professionals but they are usually not who they claim to be. If you want to evaluate them more, better go to where the studio is located so you can see their portfolio, if they cannot send it through email, and see for yourself how yours would look like. You may also see simple quotation templates. Ask the right questions when you get to list down some prospects. Make your calls to do it and check whether or not they are insured and operating legally. Also, check for credentials because they matter in a field where there is a constant competition. Remember that almost everybody owns a camera but not all of them can be photographers. The professionals do more than just taking snapshots. They have to have enough credentials and experience so you do not go wasting your money on something you could have done yourself. You may also see event quotation templates. Check if the prospect is insured so that you know you are protected if ever worse comes to worse during the project. Do not gamble with those who are doing it just for fun, if it is not that cheap anyway. 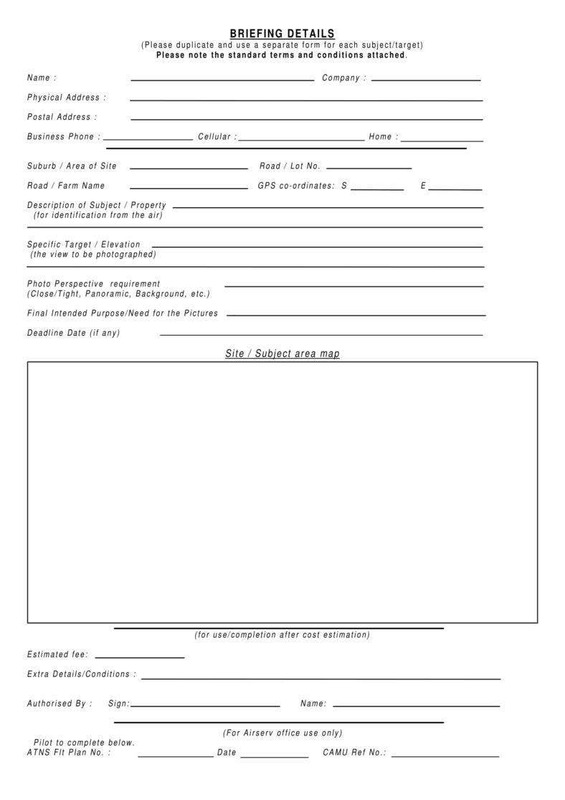 You may also see service quotation templates. People consider photography as a standalone art and this is understandable. A little bit of technology helps but without the artistry, no matter how high-end and advanced the camera and how expensive your lenses are, it still would not be enough to produce picture-perfect still life of people and things you want to be remembered. There are many things an expert will consider when taking pictures. Many people are too dependent on gadgets that pass for a camera. It takes more than gadgets to get it done right. 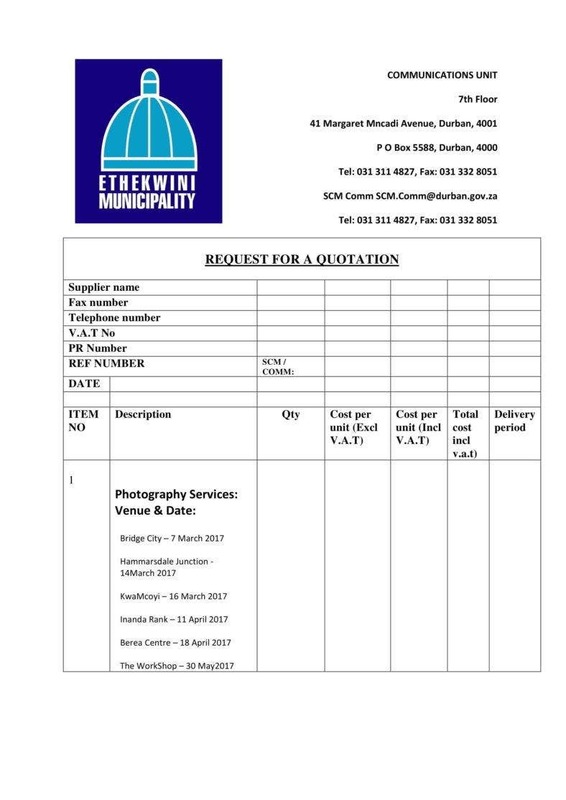 You may also see price quotation templates. The device would matter yes, but never more than the skill of the one holding it. Missing out on this can prove to be complicated later on when you see that the results are mediocre. Ask for samples or portfolios which is a collection of probably their best works. Go online to check local websites of those who are offering the service. Consider their experience and their knack for style and creativity when it comes to taking advantage of the lighting too. 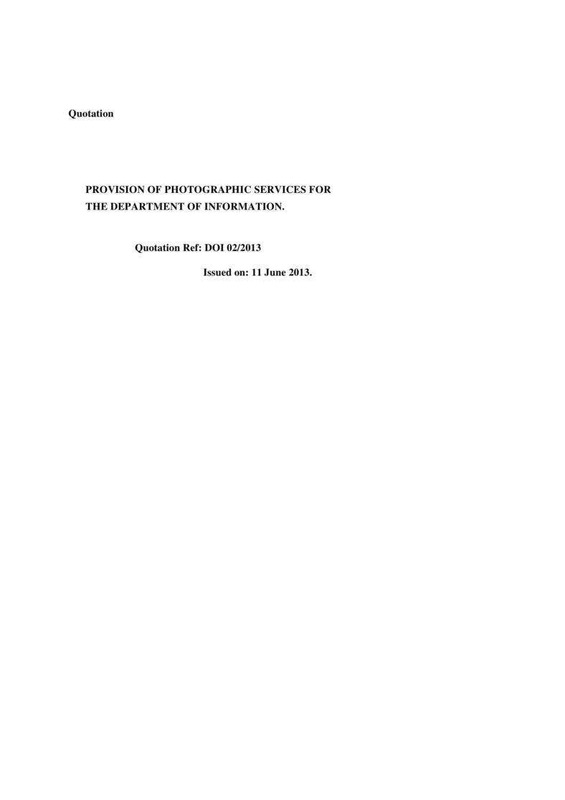 You may also see quotation format in PDF. Ask how many particular events or similar projects they handle or have handled in the past. There are those that lack knowledge with something more specific when they have focused so much on taking pictures per se. Then there are those who have put so much skill and found a niche in weddings, birthdays, nature and other stuff. Most of them have portfolios that you can refer to, just to check if they are legit. Then again, you cannot really rely on just photos on websites. Make sure that you see some printed versions too. That is how you can gauge their skills. You may also see price quotation samples. Check if their style would match to what you have in mind. No matter how good they are, if you have a personal style and your visions do not meet theirs, it would still be useless. Imagine not being able to appreciate what you have spent so much for. Consider the price, although this is not the sole thing you should focus on. Try to weigh it out and see if it is reasonable. If not, you can leave it alone and go with another one. Make sure you understand whatever contract is handed to you and that it is laid out so that everything is clear from the beginning. You may also see quotations in excel. Do your research since you already know what specialty you need. Not all of them are the same. You may encounter professionals who are best at shooting weddings, and then there will be those who are great at photo shoots of children. Make sure you are trying to search for the ones who specialize in advertising. Do not be afraid to make a deal where the price would be right. Check if the person is someone you know you can work with. You may also see quote templates. Hiring a photographer with a personality you cannot agree with, can be a bad choice. A good one will be able to ask you some necessary questions. They too, cannot just accept a project they do not think will fit them. The professionals will be able to thoroughly evaluate whether or not he is also who you want. You may also see price quote templates. Think about what your business needs are. You have to consider your website, the catalog and the kind of story that would sell the photos used. This is what the person should pay attention to, and discuss with you. Branding is a challenge. But do it right, and you will get a good response from the audience. Speaking of audience, they should be targeted. The photographer should keep them in mind during his shoot. Remember that you are trying to have your product sold to a specific market. Not all strategies will be ideal, but the right ones would be. You may also see professional quotation templates. The medium is the message, and photos are perfect examples of this. They exist to give impact and a salute to a moment frozen and tangible on a piece of printed material. Manage your expectations. Not all products and occasions will be the same and the style that would fit yours may not be the exact same one that was shown to you. Feel free to discuss your options with a potential photographer so that everything is clear and contracts will be properly set from the very beginning. You may also see formal quotation templates.